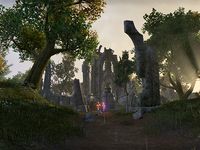 Ceyatatar is an Ayleid ruin in southwestern Cyrodiil, east of Castle Brindle. The ghosts of Hadhuul the Fire King's army inhabit the ruins. Ceyatatar also appeared in Oblivion.